Is it possible that my love of color is going away? 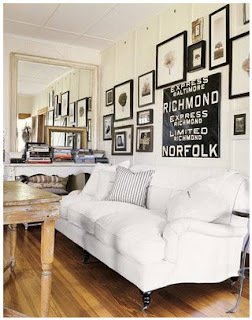 Since I got the new couch I have been looking for other inspiration and a new direction to take my family room. Of course I'm still loving the mix of old and new, I just want to change the details around a little. BUT, everything I seem to find has more natural muted color palette. Alot different from the bright, deep saturated colors I was loving before. 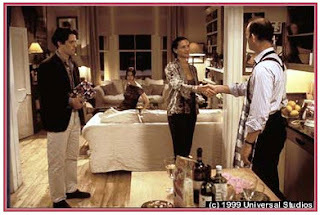 Maybe its because I watched Notting Hill this weekend and fell in love with one of the apartments (its Max and Bellas place to be exact). I can't find any better pictures than this. Maybe its because its Spring and there is a ton of color outdoors now and I don't need that same warm feeling color provides indoors anymore? Or maybe its because I'm falling in love with linen fabric all over again? I can't pick out one specific thing I like here, I like it all. The leather ottoman, all the black frames, the lighting- just everything. I still love orange, so I think that's why these pictures stuck out to me. 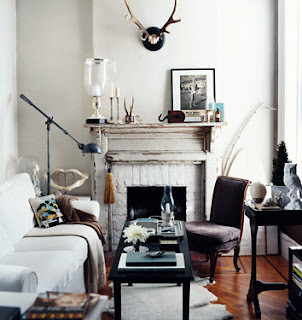 Oh and the zebra rug- I need to get a zebra pillow- that's on the list for sure. 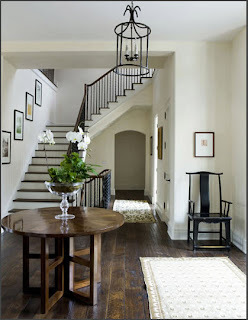 These two are traditional but don't feel stuffy- I love the dark wood here and the light wall colors. 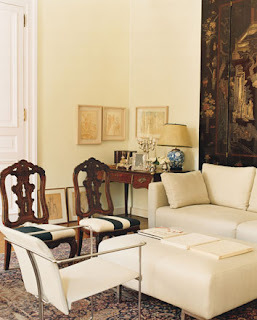 I would love my entry to look something like this- maybe a mix of modern too, I might have to throw a lucite bench in that room to make it more me. Can't forget Domino- they always had everything right. 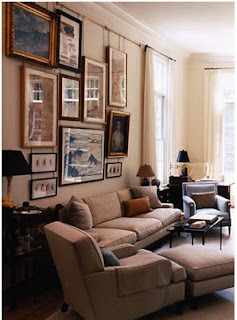 These rooms feel lived in and loved, I want to create more of that feeling when you walk into my family room. 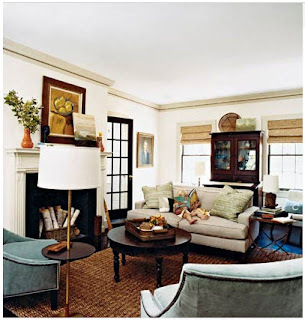 Love the above images too- they have rugs just like mine. 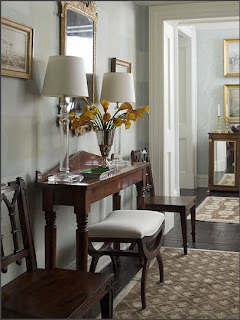 I'd love a desk like the picture in the left- so the hunt is on to find something new for behind the couch. Thats my office space at the moment. I still have not found that antique Boston sign, the hunt is still on. 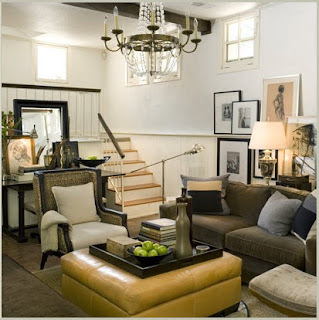 But both of these rooms have alot of black accents- I have one black lamp shade- maybe its time to get some more. 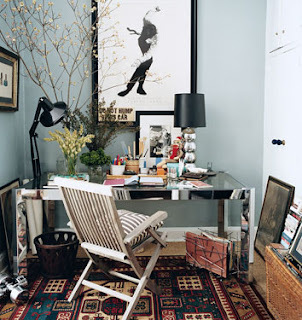 I'm loving the muted blues and greens here- oh and the sea grass rug. I'm still playing with the idea of getting a large sea grass rug to go under mine. So, the color is not totally gone in all of these pictures but I'm starting to love all the white, grey, black, linen colors and want more. Ugg, why is my design ADD so bad? This is the reason I cant buy expensive fabric and accessories because I'm always changing my mind- its a problem really. I totally understand what you mean about committing to expensive fabrics, etc. I change my mind too often! I completely understand. I love color, and then I love simplicity. My mind changes way too often to have one certain design style... just have fun with it. And like you said, don't commit to high prices! 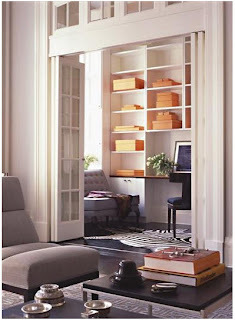 i think all of these rooms are great. 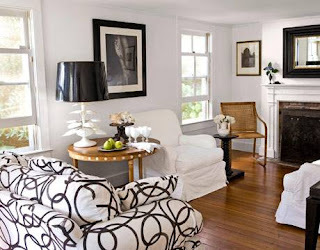 while i never really experience design ADD (i love colour, patterns, ethnic feel and some glam girly touches...but all chic!) i do occasionally experience a change in the colours i like...3 years ago i was into a deep orange and mustard yellow. for the past 2 years it's been hot pink. and now gray and lavender are creeping in :) but the good thing is if you buy the big things in neutrals - you can have fun with the colour! I always say, people go bold or beige...I am also feeling less colorful, but I have been falling in love with a pop of lemon yellow! I love the white walls. A lot of those are some of my favorite images from my magazine collection. The top and bottom ones are my favorite! They feel so fresh and springy. Love these pictures! I have been keeping my eyes open for you for the Boston sign.. Thanks Marianne, I was so sad when the one I wanted was already sold. Really loved all those pictures. absolutely love every image you picked. change is good. everything you've shown is so layered & textural- love them all! !